Makar Sankranti, apart from a harvest festival is also regarded as the beginning of an auspicious phase in Indian culture. It is said as the 'holy phase of transition'. It marks the end of an inauspicious phase which according to the Hindu calendar begins around mid-December. It is believed that any auspicious and sacred ritual can be sanctified in any Hindu family, this day onwards. Owing to the vast geography and diversity of culture in India, this festival is celebrated for innumerable reasons and in various ways depending on the climate, agricultural environment, cultural background and location. While the traditional Indian Calendar is based on lunar positions, Sankranti is a solar event. So while dates of all Hindu festivals keep changing as per the Gregorian calendar, the date of Makar Sankranti remains constant over a long term. Scientifically, the shortest day of the year is around December 21–22 after which the days begin to get longer, hence actual Winter Solstice begins on December 21 or December 22 when the tropical sun enters Makara rashi or the constellation of Capricorn. Hence the actual Uttarayana is December 21 and this was the actual date of Makar Sakranti too. But because of the Earth's tilt of 23.45 degrees and sliding of Equinoxes, Ayanamasa occurs. This has caused Makara Sankranti to slide further over the ages. A thousand years ago, Makar Sankranti was on December 31 and is now on January 14. Five thousand years later, it shall be by the end of February, while in 9000 years it shall come in June. This year, it was on January 15th. With that elaborate insight into Sankranthi, let us enter Sai Kulwant Hall, the venue for another beautiful Sankranthi. It was tastefully decorated with all the props and paraphernalia that had been made for the Sports Meet by the students. The torch bearer at the Sports Meet, a beautiful parrot, perched at the main gate of the hall. The stage was glittered with a centrepiece made of a swirl of hearts and lights. 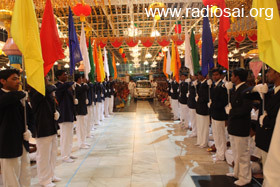 At the Yajur Mandir were waiting a parade of flag bearers to lead Swami into the Sai Kulwant Hall. The weekend had ensured that the hall was overflowing and the overflow had been diverted into the Poornachandra auditorium where a giant screen had been erected to show the proceedings of the evening. As Swami came out at 6 p.m., He moved through a passage constituted by the band boys, into the auditorium. 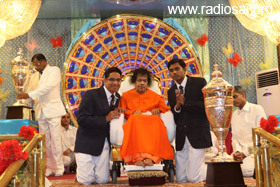 As Swami came on the stage, the devotees were simply thrilled. They rose to their feet and raised their hands up to absorb all the Grace that was flowing freely. Swami sat on the stage seeing them and His heart melted. He said that He would go down and grant darshan. The applause as Swami moved down the stage was deafening! Swami had a gentle smile and He was trying in vain to calm the excitement. He moved along the lines and people rushed like giant tsunami waves. Like the pearl necklaces that the ocean placed at His feet in Kanyakumari, they seemed to be placing the garland of their love and devotion at His feet. Blessing them, Swami moved up the stage. From there, He tossed a vibhuti packet for a student who was seated in the ‘D’, manning the projector. Then, He exited the auditorium. 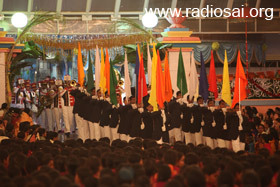 The procession of flag bearers and the brass band led Swami into the hall. 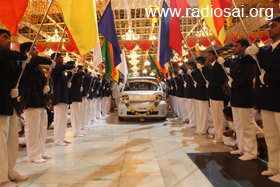 Reaching the centre, Swami moved through a canopy of flags and then completed the darshan rounds. As He descended from the car, the cricket icon Rahul Dravid sought His blessings. 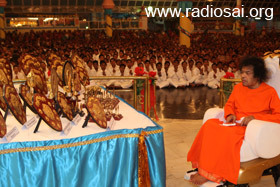 Swami moved to the periphery of the stage where the shields were placed and He cast His loving glance on all of them. Once that was done, He arrived to the centre of the stage. 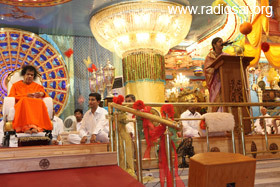 He asked the bhajans to stop and calling the Registrar, began to supervise the proceedings for the evening. The first speaker for the evening was Sri Sanjay Sahni, an alumnus of the Institute, currently the Principal of the Brindavan campus of Swami’s University. The Sun's northward journey is symbolic of man's Godward Journey, said the speaker greeting one and all on the auspicious occasion. Referring to Shankaracharya's spiritual pursuits leaving the world for the Divine, which was triggered during Makara Sankranthi, the speaker added that, Sankranthi is the best time for spiritual pursuits and thus the significance of Sporting and Cultural heroics. In his short speech he traced the Sports in Puttaparthi, the inception of a world class indoor stadium and the international cricket match, highlighting Swami's special efforts to encourage His children in Sports. Referring to various items presented by all the institutions, he summed up declaring that Swami had always been their inspiration. He then introduced the second speaker, Ms. Suma, faculty in the Anantapur campus of the Institute. Ms. Suma, a veteran of over twenty sports meets, highlighting the speciality of Sathya Sai Educational System, that according to her brings out the 'soul quality', narrated some inspiring incidents during the sports meet coupled with her observations that God has always been the Doer. The Sports festival is fully saturated with God's Love where it gets its full meaning, asserted the speaker. Even as she spoke, Swami was so moved with her observations and He vehemently nodded to some of her statements. This was especially seen when she said, “Education is for life and not for a mere living.” She ended her inspiring speech with a prayer to Swami. Swami now was very eager to give away cups. The meaning of the statement, “God sees the efforts and not the results” became amply evident as the huge cups were brought out. All were of the same size and finish and Swami said that He was happy with all. It was an all-winners day and it unfolded beautifully. 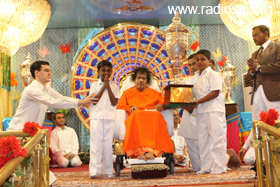 Swami first called for the Primary school children and two representatives came to the stage to collect the cup. Swami was so moved and happy and he told the Registrar to keep the cup aside safely. As they posed for a photograph, the cup was taller than the kids! 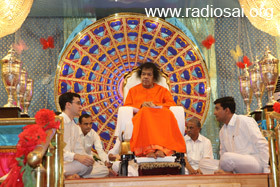 Swami then called for the representatives from Brindavan. In this manner, Swami asked for all the six campuses and everyone was delighted. 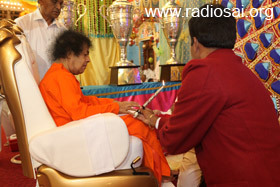 In Swami’s view, all were winners! Once that was done, all the medals were brought up the stage along with the certificates. This chance was given to the students and they moved up the stage one by one. 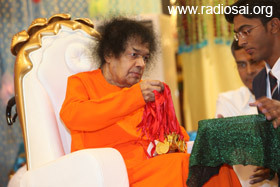 Swami blessed all the medals by raising them in His hands. He was so happy and He seemed to be in a mood of almost giving Himself to His children. Once all this was done, Swami called the Registrar once more and said that He wanted to specially congratulate and bless all the students who had participated and sweated it out for the Sports Meet. Thus it was that the mikes were brought out again and at Swami’s command, each of the campuses was congratulated as rounds of applause rented the air. 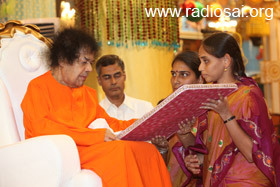 Out of the blue, Swami also mentioned, “The students of Muddenahalli have given me so much joy” and became quite moved. That was announced and it seemed to receive the maximum applause. A special mention was made about the drama that had been presented on January 13 too. Swami was so very happy throughout all this. Then, He blessed the prasadam for distribution. There were calendars too that Swami blessed for all. 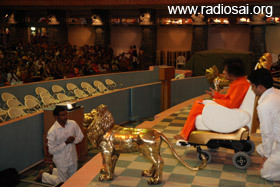 As the distribution went on, Swami sat on the stage watching this. In the meantime, the Institute brass band began playing their many tunes. Throughout the year, they yearned for an opportunity to play for Him and that did not seem to materialize at all. “God’s delays are never His denials” is a cliche and it is a cliche with a reason. That’s because it always happens! Swami simply sat hearing about half a dozen pieces the band played and it was only after they had exhausted their wares that Swami asked for the aarthi. 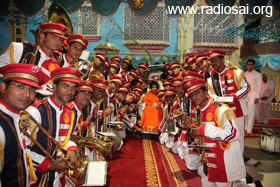 It was at 8 p.m. that Swami moved into the Yajur Mandir after granting group photos to the members of the band.